After an unconscionably long hiatus (I blame finals and other end-of-the-year miseries) I am back! “Back” applies in two ways: first, I am back to posting this blog, where I intend to write posts weekly over these 14 weeks of summer, and second, I am back in California. I will be in California for five more weeks, after which I will be headed back to DC for a few days, and then eight weeks in beautiful Wilmington, Delaware, known in legal circles as one of the locations of the Court of Chancery (where I’ll be interning) and known in pop culture circles as the nameless setting of Fight Club. Hopefully during this time there will be wine, wine, and more wine. If this past week has been any indication, there will be plenty of that this summer! I have to write a few posts, one of Deep Sea Wines (which was gracious enough to send me two bottles to review), another for a great product known as the Wine Diaper (it’s probably not what you think it is), and yet another for a book by Matthew Frank entitled Barolo. And, I’ll have to write about a very wonderful evening at Founding Farmers in DC at which a bottle of Riesling figured prominently–that’ll be coming soon. All of these will take place in good time, but before I do I wanted to “clear the palate,” so to speak, by writing about a few of the wines I’ve had at home. One of my habits while at home is to buy a few bottles with which to tide over my mom until my next visit. I had purchased a few bottles during Spring Break, and to my surprise (and pleasure) I found that one of the bottles had not yet been opened. 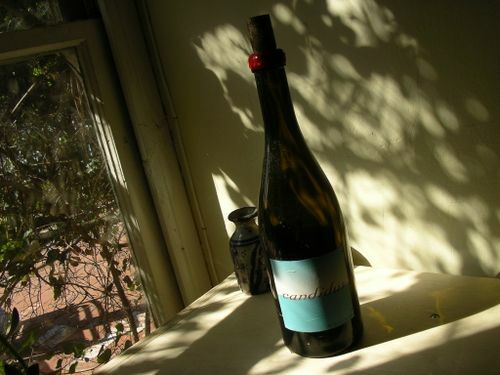 This bottle was the Candidus from Malm Cellars. Malm Cellars is a one-person show, helmed by Brendan Malm. He doesn’t have a winery or vineyard, but he sources fruit from select growers to make his wines. One such wine, his 2007 Sonoma County Pinot Noir, garnered a great review from the LA Times. The Candidus, which is made from a bunch of undisclosed white Rhône varietals (but also apparently includes Chardonnay concentrate according to Dave from Mission Wines), is about $16. It’s intensely aromatic–I’m thinking Viognier or Muscat (though I’m not sure if Muscat is a Rhône varietal)–with an assertive nose of quince and honey. It’s pear-colored and appears on the viscous side. Excellent: full of dried apricot and citrus, full bodied yet light, good acidity, very pleasant. The Candidus was good even on the second day, but alas, a 750 mL bottle only lasts so long. My third day at home and there was nothing left to drink! A trip to Mission Wines was in order. 2009 Torii Pinot Gris | Willamette Valley, Oregon | notwithstanding my Pinot Gris/Grigio bashing above, this was a wonderful example of the varietal. Great acidity, lemon curd, flowers, and minerality. Hits you right in front of the mouth and doesn’t let go. 2009 Bella “Special Release” rosé | Sonoma Coast (? ), California | made from a blend of Grenache and Syrah, this rosé packed a serious color (almost as dark as a light Burgundy or Beaujolais, as dark as a rosé made from Malbec) and serious flavor: peach, watermelon Jolly Rancher. Think of this as Domaine Tempier’s um, racier backwater cousin. 2007 Louis Jadot Côte de Nuits Villages “Le Vaucrain” | Côte de Nuits, Burgundy, France | a village-level Burgundy, tart but with a nice mouthfeel and a satisfying mid-palate. Fig, membrillo. A perfect bistro wine, served chilled with steak tartare on the side, and at the mid-twenties at the perfect price. 2004 Bodegas Luzon “Alma de Luzon” | Jumilla, Spain | more on this below. Upon Matthew’s recommendation I picked up a bottle of the 2007 Weinhof Scheu Spätburgunder from the Pfalz region of Germany ($15.99) and, a day or so later, a bottle of the aforementioned Alma de Luzon. The Spätburgunder, which is German for Pinot Noir, was fantastic! Never mind the long, narrow Riesling-type bottle in which it arrives: this is serious red wine. A light brick color, it is full of tart cranberry and has hints of earth, very light-bodied and excellent chilled. This is serious value for the money: leave it to the Germans to deliver efficient, precise wine. The Alma de Luzon is a Jorge Ordoñez selection, so you know it’s good. The first release, this normally retails for $67 but given the poor economy, its distributors unloaded quite a few cases to Mission where it is going for $27.99 a bottle. This is an insanely low price for a very good wine. It’s rare that everyone in my family likes a particular wine: this had something for everyone. Dark, inky color. Tobacco and stewed dark fruits on the nose, a hint of graphite. In the mouth it had prune, blackberry, fig jam, clove. It reminded me of Madeira, or the 2005 Ridge “Paso Robles” Zinfandel I had a few months ago. Although this blend of 70% Monastrell, 20% Cabernet, 10% Syrah spends 22 months in oak (60% French, 40% American) and has a very dark, extracted color, it is not a Vaynerchukian “oak monster”: the tannins are there, but they’re silky and well-integrated. Indeed, the Alma de Luzon’s acidity is more pronounced than its tannins. Altogether, this is a tremendous value and a crowd-pleaser. Buy it, drink it with a meal (I’m thinking red meats or molé, even), drink it with dark chocolate-covered blueberries, drink it by itself–whatever you do, be sure to buy it and drink it. So, I’ve been at home for a week and a day and I’ve been able to try some wonderful wines. I would recommend all of them. With selection like this, how can I not love South Pasadena?